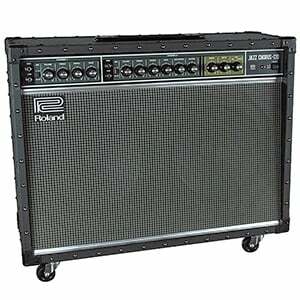 Roland is one of the few brands out there that has a very strong line of solid state amps. Their JC-120 Jazz Chorus is by far one of the most capable amps you can get under $1000, and there are numerous reasons for that reputation. Let’s take a closer look. The design of the entire amplifier is very much reminiscent of late ’80s, early ’90s. Roland’s decision to go with a retro look was the right one to make. On that note, the controls are pretty much done the same way. At the very top of the speaker grille, there’s a slim strip dedicated to controls. Going from left to right, we see two input channels, each with its own three-band EQ. Second channel also comes with a distortion and Reverb knob. At the very end, there is the effects control cluster with a Speed, Depth and mode select knob. Generally speaking, everything about this control cluster looks intuitive. Roland labeled each button, switch and knob in the most simplest and easy to understand way. Dialing in a decent tone takes some experimentation, but ultimately no time at all. It’s also worth mentioning that controls are very responsive and tactile. As you have probably noticed by now, this is a solid state amp. However, it is anything but your standard combo. Roland has actually used two power amps, each of them running to a dedicated speaker. What this does is create a very genuine stereo image, especially when you start rocking that Chorus. Each amp packs 60 Watts of power, adding up to a total of 120 Watts. Roland JC-120 Jazz Chorus is best known for its clean channel, but there is also a distortion channel available. Effects include a Reverb, Chorus as well as an adjustable Vibrato. Speakers Roland has chosen for this build come in form of two classic silver-cone units we have seen in other Roland designs. The voicing and power handling of these is impressive, which definitely adds to the flavor of this amplifier. Lastly, there is the stereo effects loop as well as a footswitch. Here’s the deal about Roland JC-120 Jazz Chorus. The clean channel is out of this world, especially for a solid state build. It is a blank canvas that will give you everything you could ever need to build a good tone. Even though Roland’s built in effects are nothing to write home about, the sole fact that this thing packs two amplifiers and is actually capable of genuine stereo sound is what it’s all about. The moment you plug your pedalboard into the stereo effects loop, you will know exactly what we are talking about. You will have a very hard time recognizing your pedals even though you have probably used them a thousand times so far. Volume is there in abundance. You can easily bring this thing on a stage and get the job done without feeling underpowered. In essence, this amp offers a very impressive set of features. While Roland JC-120 Jazz Chorus is far from being a jack of all trades, it is truly a unique amp. In terms of solid state builds, it is packs what is probably the best clean channel in the industry. Combined with lots of power and stereo output, it’s impressive. For more info about the Roland JC-120 Jazz Chorus, click here. 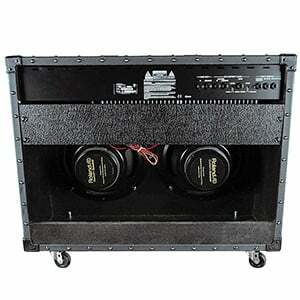 For more Best Guitar Amplifiers Under $1000, click here.